Ever find something you really would like to buy, but don’t want to pay full price? If so, try buying a floor model. Stores have to move these items from time to time and usually do so at a discount. This TabLe & cHaiRs, rUg and DollhOusE I found at a Potterybarn Kids store. And best of all, they were all floor models. 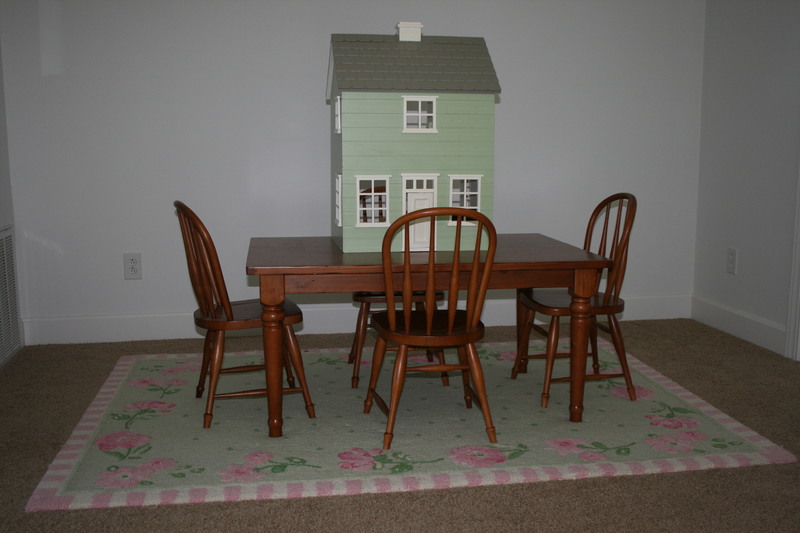 I was able to get a 50% DisCouNt on the table & chairs and rug, as well as a 40% discount on the dollhouse. I found all these buys in the summer and instantly I had a head start on my Christmas shopping! Many times stores don’t advertise these discounts, so you may want to ask the sales clerk if there are any discounts on FlOoR mOdEls. I was browsing and just happened to be looking at pricetags. Another option is to put your name on a WaiTiNg LiSt for a floor model that you are interested in. I have done this before and although you may have to wait for a few months or longer, you may be able to land a really GoOd DeaL. Of course, there are no guarantees your name will be the top name on the list, but it’s worth a shot. So next time you fall in love with a piece of furniture or household item that you don’t want to pay full price for, give it a try and see if you can’t land a great deal. It may take PaTieNcE, but it will be worth it. Don’t ya just love a great bargain???? Way to go..they are adorable. Terri, I do love a great bargain! It is like treasure hunting! !